I've been thinking a lot lately about knitting toys -- about how much time it takes me for each one, and how I could never charge enough to pay myself a reasonable wage. Of course, I didn't start doing this to make money. I started Fuzzy Mitten partly to keep me from going crazy with boredom during the winter, and partly because I love knitting these little cuties. But I almost burnt myself out rushing an order of four toys in one week. Then I nearly messed up the deal, and was starting to think about not even selling them any more, aside from maybe at craft sales. It just didn't seem worth the effort I put into them, and I wondered if people even appreciated the amount of thought, creativity, and heart I put into each one. Thanks to the helpfulness and understanding of the shop owner who ordered the toys, it all worked out for the best. The four toys are on their way across the globe as I type this. I hope whoever buys them in Kilauea really loves them. But I was still thinking of what I want to get out of making the toys, how to keep both myself and my customers happy. What I've decided is to make fewer toys, knit them from good quality yarns, and make them with as much character as I possibly can. They will now come with cute little sleeping bags, because I love sewing and want to include it too. I might raise the price a tad to cover the cost of the fabric. I've also fixed the shipping costs to be more accurate, and give people more options if they want them. As a project I started to keep myself occupied, Fuzzy Mitten has turned into something I love, and want to keep loving for a long time to come. I didn't realize it at the beginning, but a business like this is an ever-evolving thing. I need to stay flexible, and change what I'm doing to fit with the rest of my life and what people want from me. I think that's a challenge I will enjoy, even if I get small panic attacks when things don't go quite perfectly. I see now I can come out of them with even better ideas for the future. Posted by Barbara Prime at 5:18 p.m.
November 25, 2007 at 5:14 a.m. I understand what you mean, Barbara. I don't sell anything, but recently committed to exchanges and a RR relating to my stitching. The stress at times to meet the deadlines takes all the pleasure out of the stitching. I have to remind myself that I do this for pleasure and make myself slow down and not try and meet unachievable deadlines! So you need to concentrate on doing those things you love most. The rest is optional. November 25, 2007 at 7:46 a.m. I recently found your patterns and blog, so I haven't been reading for very long. 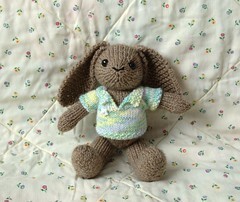 I love your little critters, and purchased two patterns to make for gifts. It is so important to think over the things that you wrote about regarding your business. I have done production work in the past, and I quickly lost the enjoyment for it. I think that you are on the right track to decide to do things differently, changing as You want/need to, to keep it fresh and to keep the creativity flowing. I tell myself that I can't please all the people all the time, especially if I don't feel pleased while I am doing it. So as others have said, do what you love. It will work out. Once my two little monkeys are knitted and dressed, I'll be back for more patterns. These are for two of my children (ages 16 and 19!) and I know that they will love them. Thanks for your wonderful work! November 25, 2007 at 1:03 p.m.